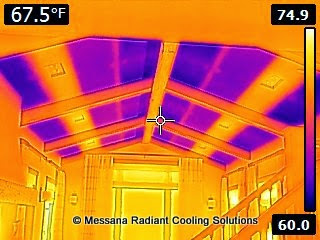 Infrared image of radiant cooling system at Lambert Residence, in Los Gatos CA. House is tested in radiant cooling mode. 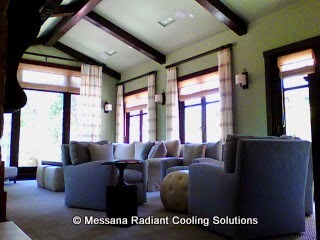 High ceiling with wood ceiling beams attached on top of the Ray Magic panels. The ceiling height goes from 9 to 14 ft. The coverage of the ceiling surface is about 70% of active Ray Magic gypsum panels.